A flat roof is common on many types of commercial buildings and businesses. While flat roofs have a lot of advantages, they do require correct construction and maintenance in order to stay functional. Some of the most common flat roof maintenance mistakes lead to more serious problems. Here we have a list of these common mistakes that most people make, and some ways to avoid them. Poor Drainage: When your flat roof is installed, you want to make sure that there is proper sloping and that drain spouts are in the right location. Poor drainage can result in ponding water, which can damage roofing materials and results in leaks. When performing maintenance, you will want to check for ponding water and clear drain spouts of any debris. Wrong Roof Coating: Depending on the climate, you will need to apply various types of roof coating in order to protect the integrity of the roof. Many people may forget to apply coating, or apply one that is not suited for humidity, rainfall, or snow. If you are unsure about which coating is right for your roof, contact a roofing contractor. Patchwork Repairs: Another mistake that people commonly make when it comes to their flat roofs is failing to make adequate repairs. Some may make the mistake of only addressing visible issues, rather than fixing the root of the problem. It is always a good idea to consult with a roofing professional, before making any repairs. Poor Installation: Some roofing problems begin with poor installation. These include improper installation of flashing, use of weak membranes, and inadequate caulking. If you believe your flat roof has installation mistakes, it is a good idea to have it inspected by a roofing professional to diagnose and repair any issues before they become larger problems. Failure to Remove Snow and Ice: During the winter months, snow and ice accumulation can seriously damage flat roofs. Many people may neglect to remove snow and ice accumulation which can result in ponding, freeze-thaw, and leaks. If you do not have the capabilities to remove the accumulation on your own, it is best to call in a professional. Lack of Ventilation: A common concern with flat roofs is ventilation. When your flat roof is installed, you need to make sure that ventilation is accounted for, to prevent excess moisture from building up. Too much moisture can result in the growth of mold, mildew, and decay. To prevent this problem, have a pop-up vent and ventilator on opposite ends of the roof. Remember to check the ventilator often to make sure it is functioning properly, and that you do not have a build-up of moisture. 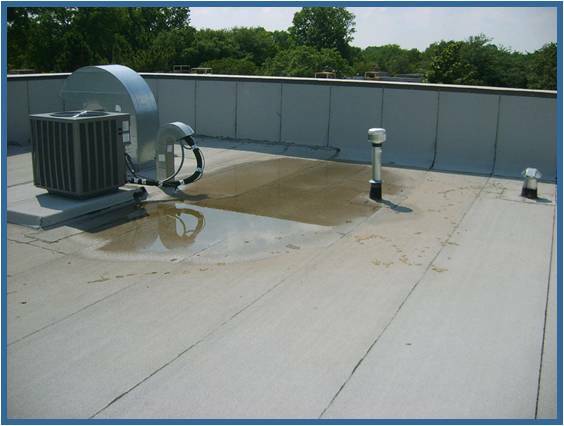 In order to avoid these costly damages, it is crucial to routinely inspect your flat roof for ponding water and drainage issues. You may also want to have professional inspection and maintenance completed by a roofing contractor at least once a year, to diagnose and repair any issues before they result in more serious damage. Maintaining the integrity of your flat roof is a concern for any business owner. To learn more about maintaining your flat roof properly, contact RoofSlope today!